TransportiCA: CityLab: Does the OneNYC Sustainability Plan Really Address Equity? CityLab: Does the OneNYC Sustainability Plan Really Address Equity? New York City’s environmental justice leaders offer ideas to strengthen Mayor Bill de Blasio’s equity goals. When Mayor Bill de Blasio introduced his OneNYC plan to preserve the city’s future on Earth Day last year, he delivered the news from the South Bronx community of Hunts Point. Standing with him was Kellie Terry, the then-executive director of The Point, a Hunts Point-based grassroots organization focused on economic development and environmental justice. Given that the South Bronx is one of the poorest areas in the nation, de Blasio’s venue choice appeared to signal that OneNYC would focus on the city’s historically most neglected neighborhoods. At the time, Terry served as a co-chair of the New York City Environmental Justice Alliance, a coalition of community-based advocacy groups. It seemed, then, that the progressive mayor was aligning himself with these advocates’ principles. De Blasio’s emphasis on “equity”—defined as an “economy that offers well-paying jobs and opportunities for all New Yorkers to live with dignity and security”—in the OneNYC plan reinforced that notion. Terry got official notification from the mayor’s office that de Blasio was making the announcement from Hunts Point just the day before the event. A year later, judgement day has arrived. The NYCEJ Alliance’s “NYC Climate Justice Agenda” report, released earlier this month, shows that the city’s environmental justice leaders still approve of the mayor’s pledge to address racial and economic inequities. However, when it comes to the actual projects prioritized in OneNYC, the environmental- and climate-justice elements need to be “more explicitly and robustly addressed,” reads the report. The apparatus of climate change and sustainability investments in the OneNYC plan doesn’t totally match up with the mayor’s talking points on equity. Case in point: While de Blasio may have launched the plan out of the home of hip hop, few of the climate change protection projects are in the Bronx. 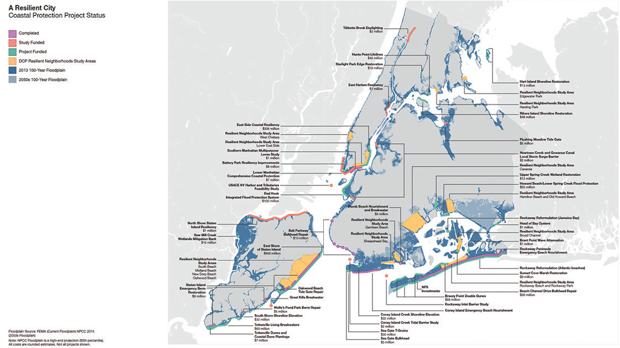 The map below from the OneNYC report shows where the city’s coastal defense projects are stacked, or are stacking up. Of the handful of projects in the Bronx, the $45 million Hunts Point Lifelines is funded with $20 million from the federal government and $25 million from the city. It’s a winner of the U.S. Housing and Urban Development’s National Disaster Resilience Competition, created in 2014 to address rebuilding after the destruction wrought by 2012’s Hurricane Sandy. 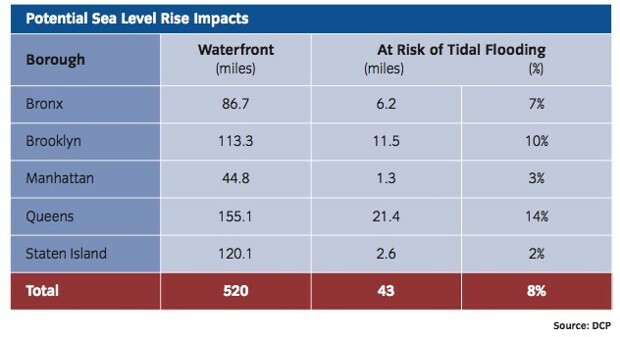 While $45 million is a significant chunk of change, especially for a neighborhood that’s suffered from disinvestment for so long, it’s well below what’s needed to fully protect the Bronx waterfront from climate-change flooding. Urban planners estimate that a total protection package would costroughly $1.2 billion—$816 million for the first phase alone, to begin refortifying the Hunts Point Food Distribution Center. The distribution center is the primary food-supply hub for all of New York City, providing 60 percent of the produce and 50 percent of the meat and fish passing through the city. It supplies thousands of jobs to South Bronx residents and thousands more to people in other boroughs and cities interacting with the distribution center on a daily basis. If it was shut down for any reason, it would be an economic and hunger disaster for the city. Not only does the $45 million Lifelines project not meet the Bronx’s complete needs, but that’s also far less funding than what other neighborhoods and boroughs are getting. De Blasio awarded $100 million to Lower Manhattan for an integrated flood-protection project last August—that’s on top of $15 million that had already been announced earlier in 2015. The Lower East Side will receive $335 million for its East Side Coastal Resiliency Project. Meanwhile, a coastal resiliency project in mostly black and Latino East Harlem was awarded only $1 million in the plan. A lot of the projects listed in the OneNYC plan are funded by the federal government specifically for areas that were hit by Hurricane Sandy. Harlem and the Bronx didn’t suffer as much as their neighbors in the southern parts of the city, and the OneNYC projects somewhat reflects that. However, Sandy was just one storm with its own unique qualities. The South Bronx is still vulnerable to future climate-change disasters, like deadly heatwaves, for instance. 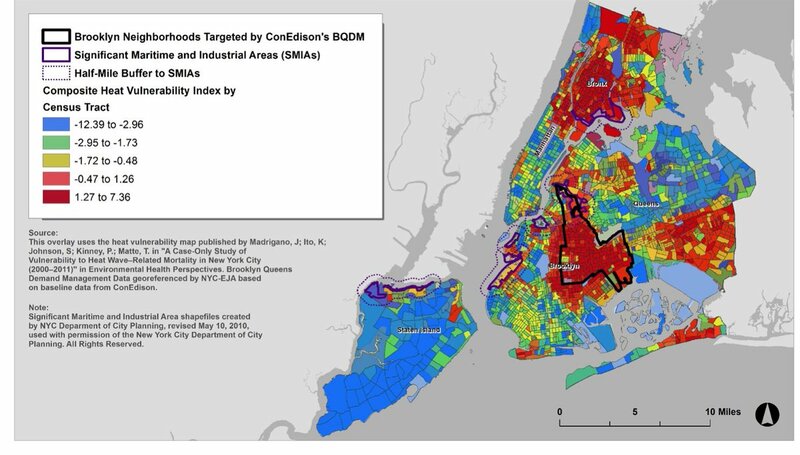 The fact that the city’s major food-supply network is located in the South Bronx should also warrant some additional attention and funding. The Bronx was mostly spared from Sandy flooding due to chance: When the storm arrived, the Long Island Sound was at low tide. But had Sandy arrived later, during a high tide, "Flooding could have overwhelmed parts of the Hunts Point Food Distribution Center in The Bronx, thereby threatening facilities that are responsible for handling as much as 60 percent of the city’s produce,” as the city has acknowledged. Meanwhile, the $45 million Hunts Point Lifelines climate-protection project is already encountering dissension. While the original proposal focused on building new levees and “cleanways,” the current version puts more emphasis in developing energy-resiliency mechanisms, like microgrids and backup generators to keep power flowing in the event of a storm blackout. But some South Bronx leaders are trying to push the city back to concentrating on flood protection. Ralph Acevedo, environmental committee chair of a Bronx community board asked asked in a DNAinfo New York article, "What good would energy and backup generators be if you’re sitting in five feet of water?" When Kellie Terry stood with de Blasio in announcing OneNYC last April last year, she welcomed his proposal. However, by the end of that summer, she was questioning his decisions. The OneNYC plan has not been a total failure on the justice and equity fronts, however. In fact, the NYCEJ Alliance members found a lot in the plan to cheer about. The city’s Zero Waste pledge to phase out all garbage delivery to landfills by 2030 is totally in line with what environmental justice activists have been advocating for for years. The NYCEJ Alliance is partnered with the Teamsters Union for the “Transform Don’t Trash NYC” campaign, which has similar goals. Also, OneNYC’s 80x50 initiative to reduce greenhouse gas emissions by 80 percent below 2005 levels by 2050 is exactly the kind of bold policy supported by the group when it led Leonardo DiCaprio and hundreds of thousands of others in the 2014 People’s Climate March. refers to the capacity of people to “bounce back” from severe weather events. However, for true climate justice to exist, resiliency cannot rest with “bouncing back” to an inequitable system where people of color and low-income communities are disproportionately burdened. Bautista says the recommendations are offered “in the spirt of wanting [de Blasio’s] plan to succeed.” He hopes to see them reflected in de Blasio’s own first-year assessment, which should be released later this month.